"Our experience with Tribute Media has been fantastic! Web marketing can be a complicated strategy for small business, and the entire team at Tribute Media has done a great job educating us as well as getting to know our business personally. We truly feel that this process has been a collaborative effort from the start. Tribute Media has proven to be a team of professionals working together to create the best possible outcomes for our business." Intermountain Pet Hospital (IPH) opened their doors more than 30 years ago, and since then have strived to stay on the cutting edge of veterinary medicine. They offer top-notch preventative, diagnostic and treatment services to their clients' beloved pets. Pet owners in the Meridian and greater Boise, Idaho areas have greatly benefited from the services offered by IPH. 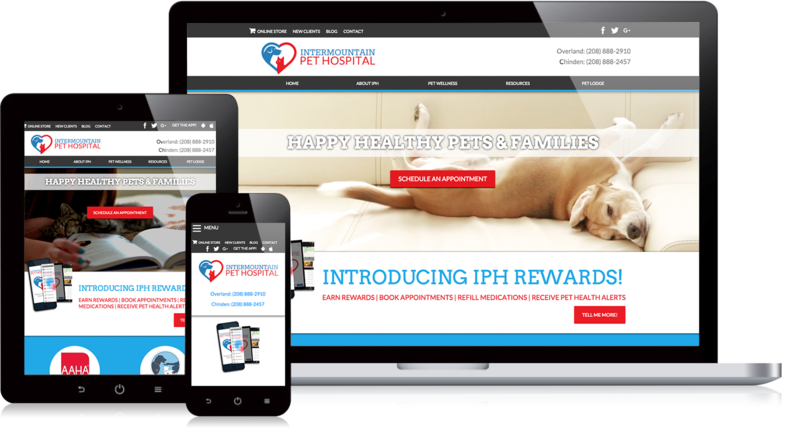 When Intermountain Pet asked Tribute Media to revamp their website and take over their web marketing efforts, the Tribute Media team was handed some significant challenges that needed to be solved. "We knew going into this project that the possibilities were endless when it came to inbound marketing opportunities. Everyone at Intermountain Pet Hospital was excited to offer education to their clients and potential clients to demonstrate their expertise." Their original website lacked an intuitive interface for users. There was too much going on and not enough direction. There was no marketing strategy in place, so we were starting from scratch. The little marketing material Intermountain Pet Hospital was outdated, not engaging and did not help the customer through the buyers journey. Tribute Media created a new website design that is intuitive for users, as well as mobile responsive and follows current design trends. Site visitors now have a clear idea of what their options are through clear call-to-action statements. The new site also capitalizes on inbound marketing opportunities that help move users through the buyer's journey. Building the website in the HubSpot CMS allows Tribute Media to mine extensive data and analytics to ensure optimal performance from the website. Intermountain Pet Hospital clients now have an intuitive and easy to navigate website experience that provides them with the information they desire. The website is designed to be informative with helpful resources within the site pages and the blog. Intermountain Pet is also now able to track users, their behaviors, and how they are utilizing the website. This has greatly expanded their inbound marketing abilities.